Home Events Multimedia Procurement Transformation Source One News Countdown to ISM2016 Podcast Series - Are You Set Up for Sourcing Success? 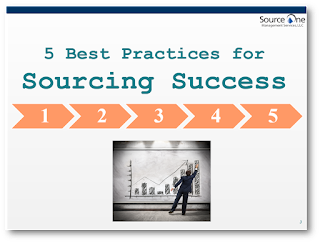 Countdown to ISM2016 Podcast Series - Are You Set Up for Sourcing Success? The premier supply chain event of the year is just two short months away! As we get ready for three days filled with engaging speakers, networking sessions, and workshops at ISM2016 , we're launching into our Countdown to ISM2016 Podcast Series. Each week, catch a new a podcast with our experts, imparting their best practices and words of advice to help improve your procurement and supply chain operations. Whether you're gearing up to go-to-market for a product or services or just want to make sure your organization is well-prepared for cost reduction initiatives down the road, there are steps you can take now to set your organization up for success. There's no one-size-fits-all approach to strategic sourcing, especially when it comes to complex spend categories such as engineered products designed specifically for your company's use. However, there are best practices you can follow to help ensure your sourcing initiative goes off without a hitch. This week, Source One Project Analyst Jennifer Engel shares her advice for properly managing even the most detailed product specifications, how to effectively communicate with stakeholders, and what key metrics your organization should be tracking. Source One's Procurement Transformation experts are honored to be the one-and-only sponsor of the exclusive procurement executive conference held at ISM2016 - Exec IN. Their team of strategic sourcing experts will be helping to facilitate the innovative and collaborative workshops and networking with prominent CPOs and Supply Leaders.